Back when we lived in northern Manitoba, our crew cab, camper and motorboat allowed us to take full advantage of the few recreational opportunities available on the edge of nowhere: fishing and camping. 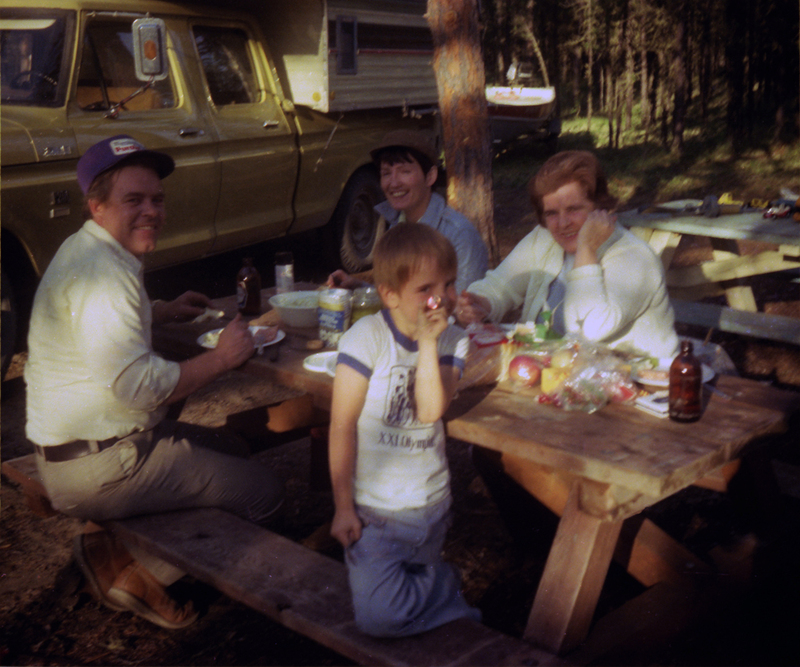 I'm fascinated by the little details in this photo that hint at the era: the stubby beer bottles, the huge Ford truck, the brown and beige colours of the truck and camper, my "XXI Olympic" shirt, the package of Rothman's cigarettes. I wish the photo were sharp enough to reveal what I'm holding up in front of my face. And if I'm not mistaken there's a toy machine gun on the picnic table in the background. That is astounding. I wonder if it works not just with digital photo, but with scanned negatives like the one in this post. I ask only because I'm not certain if the process is dependent upon digital photo metadata somehow, or if it can do the job by analyzing the pixels alone. I haven't heard about this, although I have seen some related concepts. I figure Earl must be right about using metadata, as most of Photoshop's newer functions rely on that very heavily, but also quite effectively. I am a big fan of the lens correction, which is similar. Photoshop functions that use metadata can be "fudged" by making your own data set based on your best guess. So maybe it would be possible to use unblur on a scanned photo, but it would be work. You'd likely get similar results with a bit of motion blur, high pass filter and unsharp. It would work with scanned images. It's not a focal adjustment, it's undoing motion. Not that the first part of the process examines the image and through, presumably, dark wizardry and devil worship, determines how the camera moved while the shutter was open. Voodoo and virgin sacrifice is then used to appeal to the netherworld who undo that motion using the dark arts.